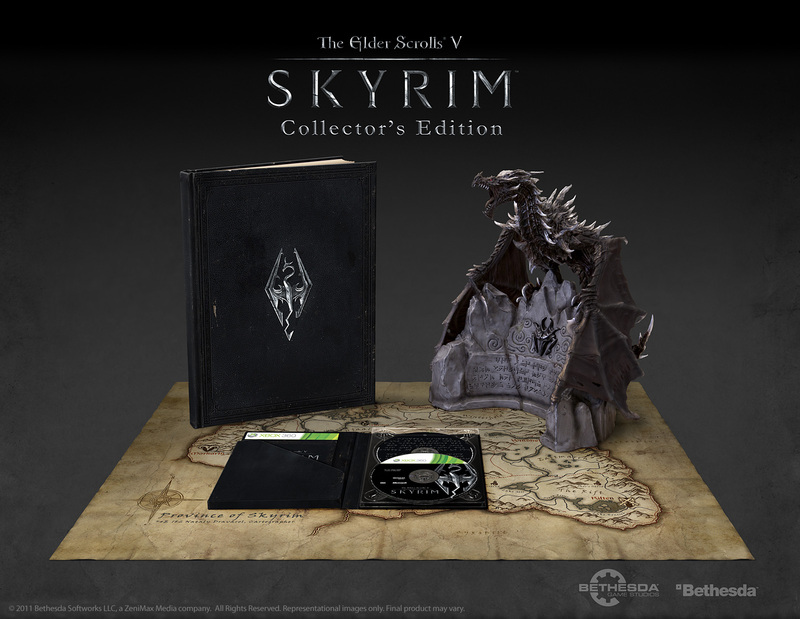 Since the game first got announced many fans of The Elder Scrolls, myself included, wondered what Bethesda would include in the collectors edition. Well, gamers can now wonder no more. Bethesda officially announced the collectors edition and its contents. -Alduin Statue: Created in conjunction with the IP Factory, this collector's only statue stands 12 tall and is made of high quality PVC. Modeled from actual in-game 3D digital files, it showcases Alduin, the World Eater. He stands perched atop one the game's many dragon walls that teach the player the lethal language of dragons. -'The Art of Skyrim' Official Art Book: Featuring over 200 pages of striking, full-color illustrations, sketches and models, this stunning 9 3/8 x 12 1/8 coffee table book showcases the characters, creatures, environments, and weaponry of Skyrim. With a foreword by game director Todd Howard and commentary from Bethesda Game Studios artists, readers will be guided through the game's iconic visual style. -'The Making of The Elder Scrolls V: Skyrim' DVD This documentary DVD contains exclusive, behind-the-scenes footage, including interviews with the Bethesda Game Studios team as they take you from concept to creation and provide insights into the story, gameplay, setting, legacy of the Elder Scrolls franchise, and much more. Now all that sounds and looks amazing, and unfortunatly, it comes with a hefty price. Those who pre-order the collectors edition will be spending �129.99 (US$149.99, �149.99, A$199.99[Australian]). It is also in a limited quantity, meaning only those who are very early in pre-ordering will end up getting a copy. Below are the links to pre-order from amazon and GAME. Update:Like with all pre-orders of Skyrim, the Collectors Edition will come with the burlap material map featured in the picture. So who is looking forward to exploring Skyrim? Is anyone here tempted by this edition to part with so much money?